This was going to be my first concert ever as a performer. I traveled down to Hamburg via Sweden with Juha, Eric, and Mads from Psuedo Sun as well as Santtu from Dark Sun in Finland. I took the ferry over to Malmö and they picked me up and we went to the ferry at Trelleborg, which then took 7.5 hours to Germany. The most boring ferry ride in history. Stuck in the cafeteria for 7.5 hours with nothing to do. Anyway, Maik had his apartment waiting for us to crash in when we did get to Hamburg around 3am. It was really nice to see so many people I had met in the past at this festival as well as new faces. We mostly hung out together but also with Andreas Stüwe and his wife. Bernhard Pospiech would show up to say hi on Saturday as well. Ed had moved to Hamburg now. 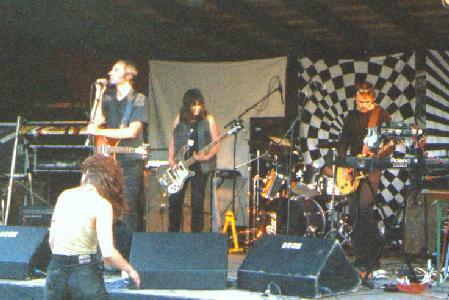 Tower of Electric Onions was the first band and they were all instrumental (guitar, bass, drums and two synth players). Seems quite a few of these bands around these days. They describe themselves as psychedelic jazz rock, which is pretty fair but they were not that psychedelic or jazzy but in between. They played mostly songs from their CD that I bought as well, and they had Nik Turner jam with them. I think they wanted him to leave after the one song they invited him up for but he stayed for the rest of the set... ha ha... They played for like 90 minutes with the encores and had some really funky jazzy jams. Cool band. Next up was Sloterdyk, a solo American act... a very cool guy named Mike Burro. I had heard his music from Feddo Reiner in Holland who is a big supporter of Sloterdyk. He was slow in getting set up but then played for one hour of some cool space travel music. 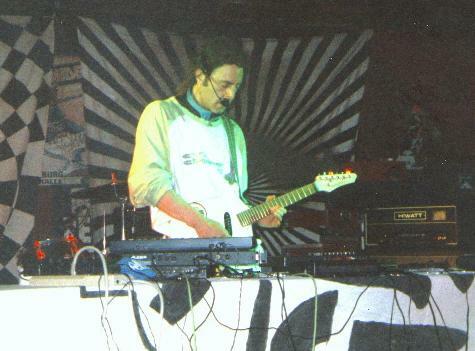 He had his CD player with samples, two small keyboards, a casio and a KORG and then he played guitar on top. Nice set up. He really could use a real drummer, at least that is what everyone seem to say.. He got a good response and played for one hour covering Golden Void by Hawkwind to the delight of the fans. I really liked his last tune, Thunderbird a lot. He said this was his first time playing it. Unfortunately, I missed the last part on my recording. We hung out a bit being basically the only Americans. Nice guy. Well, we were like 1 hour late by this time, when Liquid Visions set up. I had expected to see Lord Brain, a German space rock band, but they have a lot of problems getting it together for gigs, I am told. Liquid Visions were really excellent but they did not have the same light show as normal. I was a bit disappointed in the Lucifer Sundream this year. They were much much better two years ago. They had a lot less stuff this year. Anyway, Liquid Visions totally rocked the place and this was their first gig with a synth player and it worked great although he was never loud enough in the mix. The sound guy is great but he does not know how to mix synths very well. Anyway, they hardly played any of the same songs as when I saw them 6 weeks ago and I was totally awake this time! For those not familiar with the band they have had a heavy 60's fuzz guitar influence to their sound but now have many numbers that strech out into long spaced out jams. The band is maturing into a space rock type band now but are very tight with two excellent guitar players and a great rhythm sections as well. Nik Turner joined them at around one hour or so and they did a few songs with him, including, Master of the UNIVERSE. At the end of their set, their naked dancer appeared in blacklight paint and this was highly effective to add to the psychedelic vibe they had going. Some pretty cool jams... Great set. Now it was time for us to set up and play. This was going to be interesting. We did not start until 1am, 2 hours late. The sound man was excellent and worked hard to make sure that Santtu and I could hear what we were doing. Hearing the other instruments was not a problem for me at all. We opened with the old Darxtar number Metal Fatigue that Juha had written. Great song. This is where the wind starts. This sounded great. Next up was a Mads song called In the Court of the Silent Saints, a very nice song, quite long. All our songs were long though. If we only Had Time was next and a favorite of mine as it has the long middle and jam sections. Santtu and I did well on this one. 15 minutes long. I took a break after this song and they played a mellow song called Yesteryear. Next up was our heavy number of the set, Atmosfear. This was great and Santtu and I had a lot of fun with the synth sounds during the slow middle part before the heavy long freakout at the end. Another 15 minute song. I again took a break, as I had never heard the next Mads song called All Gone. A powerful ballad. I think we lost most of our audience after the heavy freakout, as the crowd went wild but this song was not what they were up for. We needed to play Psi Power or something. Shapeshifter was next and I came back. We closed the set with a great version (15m) of Signs of Life. I thought we played great. I think that Nik was a little disappointed we never had him come up and play as he had just been to Sweden back in March and had done some dates with PS. Oh well. That was the end of the music for the first night, ending a bit before 3! By the time we got back to the flat to crash it was like 4 and they wanted to hear the recording. We listened to a bit and then I went to sleep at 4:30, the rest stayed up for a while drinking beer. Andreas showed up at 12 and woke us up but we had to jump up and go to check out the record stores in Hamburg! They did have some good ones. 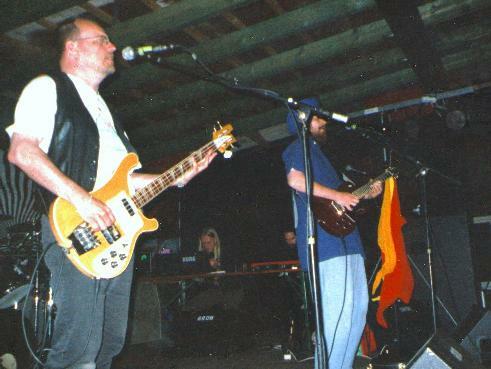 The first band to play the next day was Liquid Zoo, a local grungy-mildly psych band. They were ok but nothing special. None of their songs (all original, I think) really made you pay attention and want to listen. They played for an hour. Next up was a very different band called Das Weeth Experience. These guys were a young three piece who were making music to create a specific mood. The guitar player had a load of effects (no wah) and played with distortion, like Neil Young. They had a mixture of really great interesting songs and some really boring ones. They would play for 73 minutes. Cool band. I will be interested in seeing how they mature or if they get more commercial. They have an original sound now. Next up was what most everyone was really looking forward to, Harvey Bainbridge. He was joined by Nik on flute and sax and Mr. Dibs on bass and synth for his whole short set of 40 minutes. I don't know what the long spaced out first number was but it was excellent. Next up was a very different version of Dreamworker. Cool. Then a really long spaced intro before Freefall. Quite cool and the crowd were warmed up when the Spacehead band joined in at the end of the number. Martin from Dr. Hasbeen was playing guitar for Spacehead. He had a dreadful guitar sound, that was very treble-metallic harsh... ugh... The rest sounded great but they had a young stoned drummer who could not really keep time and the jams going very well. They had a female synth player (Louise) but you could rarely ever hear her. Harvey and Nik stayed and played on the whole set. He was tolerable on the straight Spacehead songs but... Anyway, the Spacehead part of the show, Assault and Battery/Golden Void. Next up was a Spacehead song I did not know. This was followed by Blue Skin by Hawkwind. Silicon Avatar was one of the new originals and I really liked this song a lot. Three more Spacehead songs followed that I am not sure of the titles of but the slow one was very cool and spaced out. The band was excellent on these type of songs. The heavy blunga style ones all sounded too Bedouin-Motorhead like and Mr. Dibs is good but not nearly as good as Alan Davey on the bass... so they don't all work that well. Green Finned Demon and Aerospace Age Inferno was next, with the former sounding good and the later getting very messy. Now Trev Thoms joins with his acoustic guitar and he seems to have trouble tuning the guitar and the band are not sure what to do with him… Anyway, a spacey tune is started while Trev works with his guitar and then into Master of the Universe. Osiris followed and this was very good. Then someone passed the band a big old joint and the rest of the show just went down hill. The versions of Ejection, Brainstorm and especially Silver machine were quite awful at times but the drunk people were loving every minute of it. Spacehead were very well received. It was a great time.